From the Bohol earthquake just last month to the Typhoon Haiyan/Yolanda last week, it is heartbreaking to see how many natural disasters this country endures. I have a little over a month left of my three-month practicum in the Philippines with International Organization for Migration (IOM), one of the organizations involved in the risk reduction and response process in partnership with the United Nations action plan. Safe in metro Manila, which the typhoon missed almost completely, I am saddened by the situation. Across the Philippines we estimate that there are 450,000 people in shelters and 1,790 in evacuation centers. 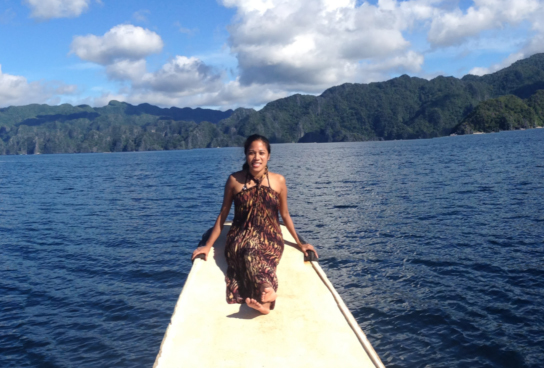 Just last Tuesday I left Northern Palawan, specifically Coron. Like Leyte and Samar, it too was located close to the path of the typhoon and has been devastated by the storm. I heard from a friend I met there that many people are missing or dead and at least 50 boats were destroyed. Places that I had just visited and photographed (see below) were no longer accessible. The large cross on the top of Mt. Tapyas fell down; the airport was out of commission; and the market was also crippled. On Tuesday, I participated in a series of health cluster meetings at the Philippine Department of Health as a representative from IOM. We discussed how to assess the situation, identify the most vulnerable populations, and then organize, prioritize, and coordinate efforts to respond to the typhoon. As someone who has no prior experience with disaster relief, I see now how difficult it can be for the people leading a response to weigh questions of necessity, efficiency, timeliness, and accuracy. It takes patience and time and involves making tough calls in order to save peoples’ lives. With my epidemiology background, I am struck by the tension between collecting and analyzing data in a timely manner and simply acting with the knowledge you have. For now aid, donations, volunteers, and medical personnel appear to be in good supply. Several factors are, however, limiting the ability of the organizations involved to carry out health assessments and get data back to the people who will decide what goes where. These same factors are also limiting organization’s ability to actually get the aid to the people. Transportation between areas is difficult. Functioning air and water transportation are critical for moving aid packages and people around the Philippines since it is an archipelago. The Samar airport just re-opened on Tuesday and Tacloban’s airport opened partially on Monday. This has caused an influx of people and supplies fighting for the limited space. The airports can also only accommodate certain planes. Ships are able to carry more supplies and teams, but at a slower pace. By land, the one route to Tacloban, which usually takes 1.5 hours, now takes 6-8 hours due to traffic. There was another tropical storm in the area that caused additional flight delays. This has resulted in further delays for transportation of goods to the people who need it most. Looting and security in the area must be addressed in coordination with delivery efforts. A state of emergency has been declared in Tacloban – reportedly the hardest hit area – due to looting. A surgeon who has been deployed to the area sent word that people are scavenging through the bodies and rubble despite their own poor health. The magnitude of the situation calls for increased coordination among all aid groups. The Department of Health and other agencies are being bombarded with phone calls, texts, emails, etc. This high volume of communication and the urgency of the situation require coordination to manage all the groups involved to ensure efficiency and prevent duplication of relief efforts. Similarly, the influx of donations and the necessity to match them to the most appropriate and needing places have put a strain on the existing infrastructure for logistics coordination and aid distribution. Poor conditions pose additional challenges for the public health response. Overall, the health system infrastructure is essentially non-existent. For example, in Tacloban, there is only one functioning hospital with only one generator. Communities are left with no power, few forms of communication, and lack clean water, medications, and the fuel to power the little ground transportation that is left. I encourage people to keep the donations and positive thoughts coming as the Philippines has a lot of rebuilding to do. Judging from my experiences here and the two disasters that have occurred within the past month, chances are the country will not be able to fully recover before another one hits. But Filipinos are a resilient people and will get past this, especially with all the support that the country is currently receiving.